Our guesthouse “Talblick” (B&B) is located near the forest in rural Baiersbronn. 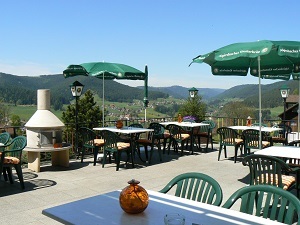 You have a unique view of the surrounding hills, National park Schwarzwald and the Murg Valley. On the roof terrace you can relax and enjoy a delicious breakfast, but also a good glass of German wine. A small, seasonal, menu card is available, or visit one of the many cozy restaurants in the area. Our new Schwarzwald-plus service allows you to fill your vacation to your own taste. No stress, no ticket purchase, but instead enjoy every day. You have a wide choice of more than 80 activities, both in summer and winter, which you can use free of charge – from skipasses, lifts, ski lessons for children, equipment rental to tropical swimming pool, miniature golf, sledding, archery , Segway tour, e-biking, wine/beer tasting, golf and much more…. There is enough parking space next to our pension. Of course motor cyclists are also very welcome. You can park your motorcycle in one of our garages (reservation recommended). Free WiFi is available throughout our guesthouse. Let the Black Forest surprise you by its versatility. 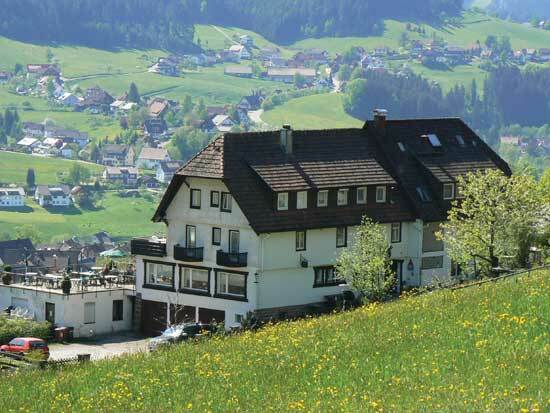 Here you find rest, space, sloshing streamlets, romantic villages, in short all you can think of for endless enjoyment. We ensure a memorable vacation in a cozy atmosphere and we look forward to your arrival. Copyright © 2019 Pension Talblick All Rights Reserved. Okay, thank you and close.